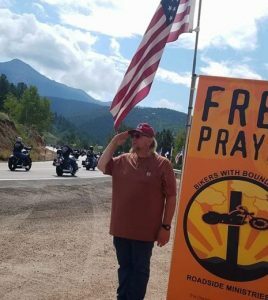 We sat out 3 days, August 17-19, along the route of the annual Veterans Rally in Cripple Creek. It was reported there were 5000 motorcycles in the ride Saturday which went right by our set-up site. It was inspiring and humbling to see so many veterans wave, honk and high-five us as they went by. Emil had attached a US flag to the banner, definitely a God idea. We got to pray with several people.